Not only is there a trio of new Entourage maps for you to master, but you can do so while building both your bank balance and reputation. Today through Thursday, August 25th, there's Double GTA$ and RP on the Entourage Playlist, featuring new maps set in El Burro Heights, Paleto Bay and Pillbox Hill, all easily accessible straight from the GTAV boot screen. And if that's not enough to whet your appetite, then capitalize on Double GTA$ and RP across all Entourage maps for the entire week. Double GTA$ and RP windfalls don't stop at Entourage, they extend to all Rockstar-Created Stunt Races as well. 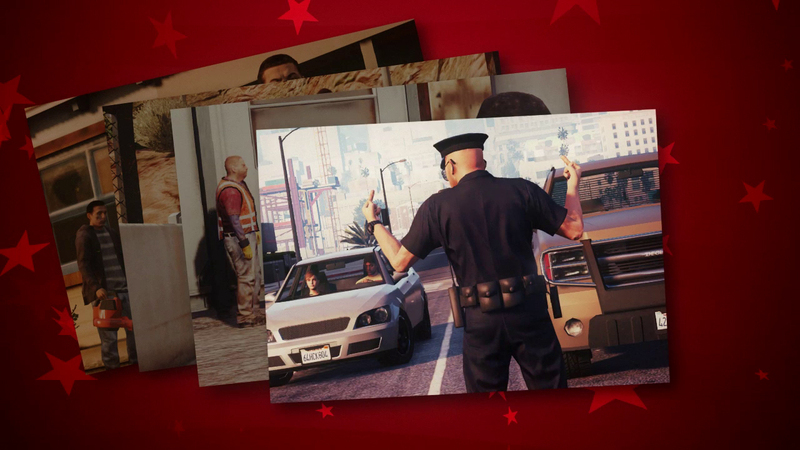 If you're looking to add a bit of madcap mileage to the week's mix, take on some Cunning Stunts while raking in some well-earned extra GTA$ and rep.
Whatever tricks you've got lined up your sleeves for the week, make sure they're executed in style. Add the Red Stunt Jumpsuit to your must-have Stunt wardrobe by logging into GTA Online between now and Thursday, August 25th to ensure you look every inch the part. With deals to do and tracks to win, don't miss the week's discounts to help you get the edge on any competition around. If you're in the market for some fresh wheels, there's a cool 25% off the Grotti X80 Proto, Dewbauchee Seven-70, Progen Tyrus and Vapid Desert Raid. For those wanting some accompanying armor on their drive, check out the HVY Insurgents at 50% off (with the Heist completion prerequisite temporarily waived). Stock up and make the most from 50% off Sniper Rifles, Miniguns, Launchers, and Ammo to ensure you're prepared for any eventuality. Put your discounted X80 or Tyrus to good use in this week's Premium Stunt Race: Plummet, for Supercars only. As a reminder, there are cash prizes for podium finishers of all Premium Races: First place gets GTA$100,000, second gets GTA$30,000 and third past the checkered flag gets GTA$20,000. Even if you don't finish in the money, all racers are guaranteed Triple RP. To join a Premium Race, enter the yellow Premium Race blip at Legion Square or use the Quick Job App on your in-game phone and put down GTA$20k as an ante to take on seven other hopefuls. Does anyone know? Is there an option to install a roof at LS Customs for the 811 by Pfister? Or does the 811 by Pfister come equipped with a roof? So which is it? Is there an option to install a roof at LS Customs for the 811 by Pfister, or not? Or does the 811 by Pfister come equipped with a roof, or not? LSC has options for a roof or not. Does the 811 by Pfister come equipped with a roof? Or the option to install a roof at LS Customs? 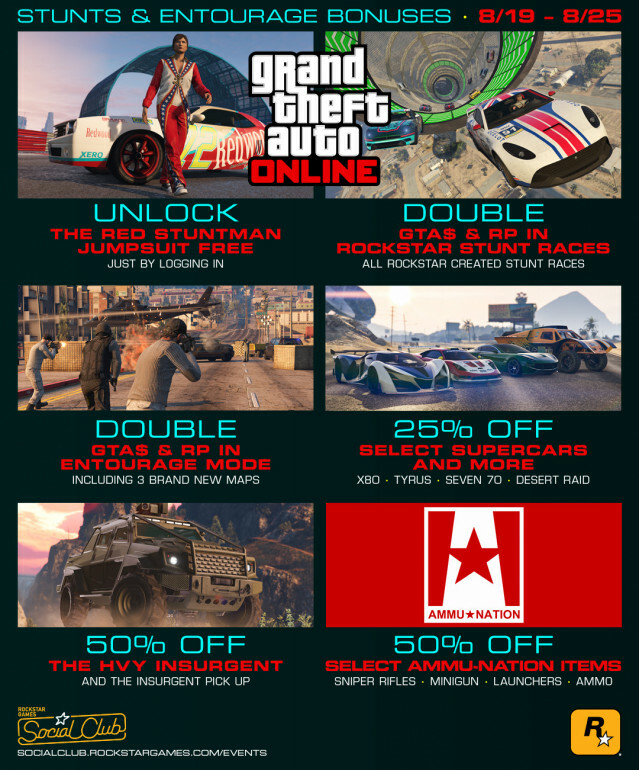 Bonuses, New Entourage Maps, Jumpsuit, More - This weeks discounts and bonuses in new-gen GTA Online plus new Entourage maps and a jumpsuit!